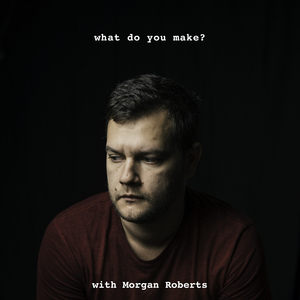 Morgan Roberts chats to musicians, artists, photographers, designers, and other creatives about what they make. Mel Comerford comes on the podcast. Claire Tonti is a Podcaster, Producer and Compulsive Creative. Photographer and Black Metal enthusiast Oli Sansom. Comedy Maker and Podcaster Vicky Hanlon talks comedy, poddy, Julia Gillard, Footy and how to be banned from open mics forever please! Actor Melanie Zanetti comes on the podcast. FIXED AUDIO. Performer Nicole Harvey comes on the podcast. Podcaster, DJ and Amiibo aficionado Andrew Levins comes on the show. Tenielle is a total gem. We discuss Kids Entertainment, 90's references and how it relates to a "real job. Siobhan Coombs is a podcaster and comic book aficionado who works at Kings Comics in Sydney. Photographer Milton Gan comes on the podcast. Simon Copland (pronounced COP-land, no "e") gets cajoled on the podcast all the way from Canberra. I talk to wedding photographer and small business owner Ryder Evans.